One of the hardest things to do when stepping in to a leadership role is figuring out what you can do as a manager to motivate your employees. This question rolls over and over in most minds of the leadership community. And, it can get very confusing testing, trying out different techniques, and figuring out what will work best for your individual team. But, the good news is, motivating your employees can be far simpler than you thought! A recent study has found that aside from obvious reasons - like more money, benefits, or bonuses - employees tend to stick around for other, more intangible reasons. As you can see, there are way more opportunities for creativity than you may have thought when it comes to motivating your employees. At the end of the day, motivated and engaged employees tend to have better attendance records, are significantly less likely to quit, and are more likely to foster closer relationships with their coworkers. These engaged employees are like GOLD in your company: they tend to be the culture drivers, coming up with more creative solutions to work problems. So actually, the better you can motivate your employees, and keep your team engaged, the more your business will organically grow. Who woulda thunk it?! This is definitely a shift from where traditional work culture trends have been. 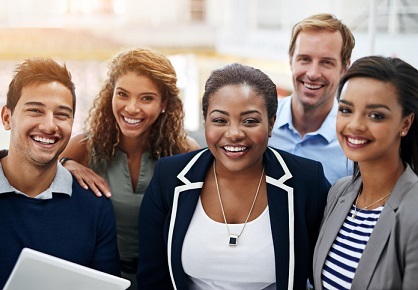 Employee fulfillment, happiness, and engagement in the workplace are among the top priorities of Millennials, says Fortune Magazine. And, according to Deloitte, this is a drastic change from where working professionals' priorities were just ten to twenty years ago. The change in culture and priorities does not seem to be a passing fad or trend, either. More and more companies are shifting their focus from investing in benefits and goodies, and more towards fostering a company culture built on the happiness of their employees. 1. Lead with great communication. Communication is oftentimes a trait that is overlooked. But, in fact consistent communication is one of the top ways to motivate and inspire your employees. One of the very best things to do is set up weekly or bi-weekly face-to-face meetings with your direct reports. In these one-on-one meetings, you can speak about goals for the week, and discuss any roadblocks your employees may have. You can also candidly speak about other things that may be on their minds, and have more fluid, honest conversations. When your employees see that you care, this adds a humanizing aspect to your professional relationship. This camaraderie will oftentimes lead to more productivity and better engagement overall. Do not underestimate the power of a good chat! It seems like treating people with respect is a given, like looking both ways before you cross the street, or brushing your teeth in the morning. But, sometimes we have to remember that our coworkers that we see every day are real people, with lives outside of work. And, they deserve the same respect that we ourselves would like to receive every day. Remember the Golden Rule? Making it a point to listen, and treat each person with respect in the workplace will make everyone feel more at ease. When people feel respected their motivation to do good work, and have the inherent satisfaction of feeling a job well done goes up as well. Positive reinforcement will always work better than negative reinforcement. Remember that! 3. Have your space reflect your culture. All of us spend a great deal of time in our office. So, it makes sense that one of the best ways to motivate your employees is by making the space that you share as conducive to maximum productivity as possible! Your employees will truly feel a sense of belonging if the space that you all share, work, and create within reflects your culture and embodies your company’s core values. Also, try throwing in some fun goodies like a ping-pong table or lounge areas where people can get away from their desks. This type of relaxed atmosphere will make your employees feel more at ease, and not as sheltered behind a cubicle. According to recent studies, the success of your office is contingent on a concept called place identity, which is best defined as an employees’ feeling that their space aligns with their personal self-image - this, combined with your company’s goals and vision, will create a sense of mutual alignment. A strong sense of place identity creates something intangible that you may not have thought would come from it: improved communication, increased engagement, and higher employee motivation. 4. Give your employees a real purpose. Some employers underestimate the value of a good mission statement and clear company values. The real driving purpose for any organization, aka the “What do we even do here?” is vitally important to the overall morale and driving forces of your employee base. 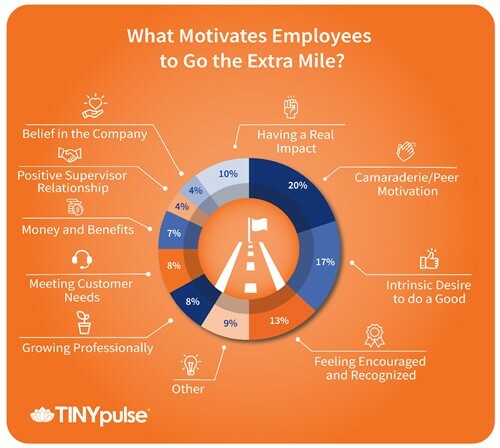 In addition to feeling real purpose for the overall company goals, each individual employee must also feel what they themselves are contributing individually is essential to the overall success of the organization. No matter what each individual job is, whether it’s a foreman at a warehouse, or managing a team at the executive level, we all want to know that our jobs matter. This combination of understanding the importance of both the company’s mission, and having an individual purpose, will help everyone in your organization keep on the same path to success year after year. 5. Give constant feedback and recognition. Oftentimes, all a person wants is to be simply recognized for a job well done. For example, if an individual has gone out of their way to help a coworker, has spent a lot of time on a single project, or has gone above and beyond in some way - show them that you appreciate their efforts! If high-achievers go on without any praise or recognition, it is highly unlikely that they will keep performing in an exemplary way. Reinforcing good traits is critical to having your employees repeat these same behaviors. Also, recognizing an employee’s longevity at the organization or celebrating major life events outside of work could also prove motivating, and show your employees that you truly care. For example: acknowledging birthdays, engagements, marriages, and work anniversaries are all perfect times to show a tenured employee that you value them - and you want them to stick around! Celebrate these events with a small gift or gesture, and make sure that what you have chosen is as individualized as possible. Trust me, keeping these loyal employees motivated and happy over time will be integral to the success of your business. 6. Foster personal growth and career development. It’s simple, if you invest in your employees, they will have a reason to stick around. Employee development also has the potential to increase sales and output. So, when your employees improve and grow, the company will as well! Invest time and energy in to the people that you already have employed at your organization. The first step is pinpointing areas of individual talent and expounding on them. Some organizations will offer tuition reimbursement, mentorship, one-on-one coaching, or even allow “shadowing” of other teammates or members of the leadership team. All of these will help foster growth, create clear career pathing, and make sure everyone stays on track to hit individual and company goals. 7. Allow pets at work. Not only are dogs adorable and amazing, they are also a great way to elevate the moods of people and alleviate stresses of everyday office life. My dog, Washcloth, comes to work with me every day, and I think his presence truly adds an element of calm and peace to a sometimes busy and hectic space. In fact, this is not merely opinion, the presence of dogs in the workplace has been proven to reduce stress, bring people together, encourage healthy living, and increase productivity. According to USA Today, you can even use the dogs in your office for team building exercises and keep everyone engaged. Way to go dogs! When it comes to motivating employees, goodies, “extras,” and benefits are now only part of the equation. Employees now need more intangible support from their leadership team and higher-ups; they need to feel that they are contributing to a larger organizational shared vision and mission. The result is an increase in job satisfaction and inner motivation. These elements can greatly improve morale, retention rates, productivity, and your bottom line.